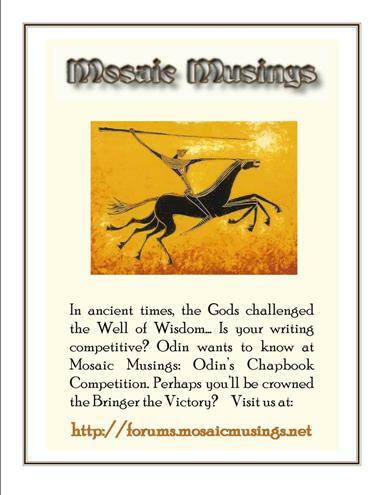 Will you battle Odin on his quest and rise above, leading your Muse to victory? This is a NON-CRIT/NON-REPLY forum. Best of luck! *Content displayed on the Site is protected under U.S. Copyright laws and cannot be copied, altered, uploaded, transmitted, published, distributed, reproduced or sold, in whole or in part for any purpose other than for non-commercial and personal use. Further restrictions on the Content may depend on the Forum Participation Rules associated with the Forum in which the Content is posted. All works posted on the Site are submitted on a voluntary basis. This allows Mosaic Musings to display and archive such works within Site, and if applicable, allows members to comment on such works. All exclusive rights are reserved by the respective copyright owners and no redistribution including publication or reproduction in any form is permitted without express permission of the copyright owner. (1) This is a private forum. Any copying of a posting in this forum is strictly prohibited. (3) Please read Odin's Terms of Service here PRIOR to posting your submission. 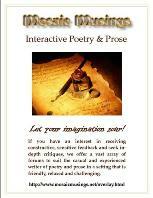 (4) The top (5) winners will be selected once each quarter ends by a minimum of (5) Mosaic Musings judges. 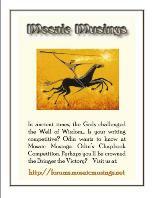 (5) First place: Two chapbooks of winner's choice from Mosaic Musing's Bookstore and a 50% discount on one Mosaic Musings, LLC chapbook contract from our chapbook package offerings. 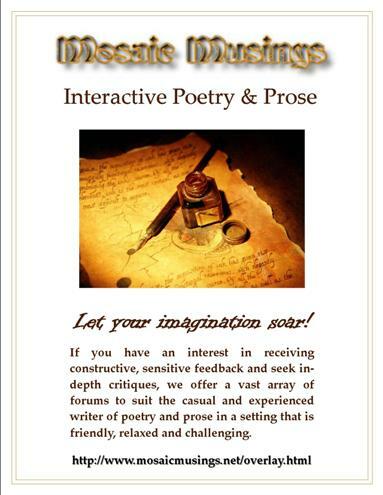 If the winner chooses, he/she may also opt to have a sample of their chapbook displayed in Digital Web Book format on our home page (cannot exceed 50% of actual chapbook content). In addition, an electronic display with award graphic will be posted on the Mosaic Musings forum board. Second place: Two chapbooks of winner's choice from Mosaic Musing's Bookstore and a 25% discount on one Mosaic Musings, LLC chapbook contract. In addition, an electronic display with award graphic will be posted on the Mosaic Musings forum board. Third place: One chapbook of winner's choice from Mosaic Musing's Bookstore and a 10% discount on one Mosaic Musings, LLC chapbook contract. In addition, an electronic display with award graphic will be posted on the Mosaic Musings forum board. We will choose (2) Merit award winners, prize: One chapbook of winner's choice from MM Bookstore. In addition, an electronic display with award graphic will be posted on the Mosaic Musings forum board. (6) Winners will be chosen and notified within 28 days following the closing of each battle (to allow for voting collaboration). (7) There will be no expiration date for the discounted packages. In an effort to easily identify the theme within a topic, we would like to recommend the use of ONE emoticon, as your Post Icon. While it is by no means mandatory, we believe this symbolistic approach will benefit our readers and critiquers. We hope the use of these symbols will make it simpler for our readers to identify topic themes and content. You will see the symbols in View New Posts as well as the forum display and the topics. I've put the symbols in alphabetical order below.